THE FIRST LAYERS OF PAINT ARE ON THE CANVAS for my piece of the five painting/pentaptych collaboration of pears, apples, carrots, swiss chard, and eggplant. I laid down the background using a mix of Pink Madder (Sennelier) and Burnt Sienna (Windsor Newton). The base layers of color for the pears and leaves are on. 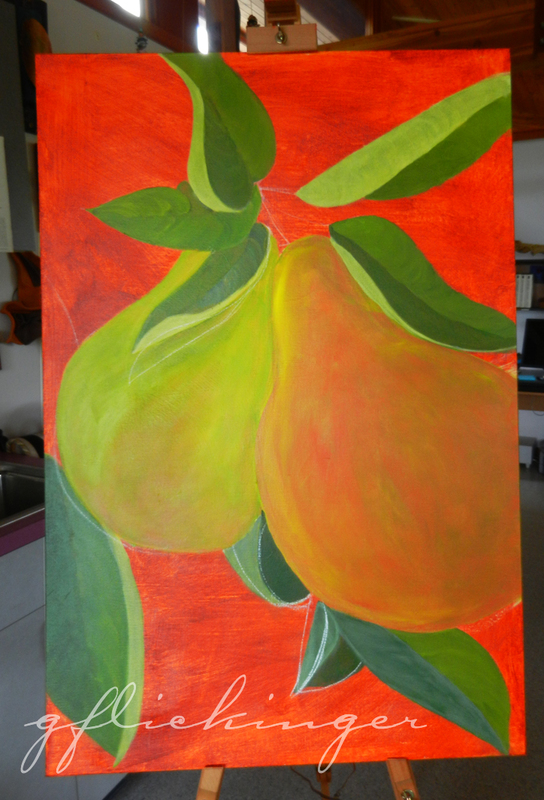 Next steps are to make the pears more dimensional, refine the shape and color of pears and leaves both, and connect with the other four artists will to make color adjustments to work towards a harmonious whole.